Marantz M-CR603 review | What Hi-Fi? We have seen the Marantz M-CR603 before, way back in December 2010, when it stood out as the only affordable, all-in-one hi-fi to let you enjoy your music from just about anywhere. CD? Check. DAB? Check. Digital iPod connection? You betcha. How about network streaming and internet radio? No problem – you can even add Napster and Last.fm to the list. An extra £39 gives you Apple AirPlay support, although it's currently free until the end of 2011, and there’s an optional Bluetooth adaptor, too. However, mighty as that feature list might be, the Marantz is no longer the only device that offers it – so it needs to sound great if it’s going to emerge from this test unscathed. It starts strongly. We’d argue that this is one of the best looking, most classy units in its class, and as well as feeling brilliantly well-made it responds very quickly to commands from the effective remote control. The big display manages to fit in a lot of info and remain clear at all times, and the disc drawer is solid and quick to open and close. This is sophisticated, well-made kit. Use the Marantz the old fashioned way by playing a CD, and it will reward you with an detailed, brilliantly judged delivery that’s brimming with energy. Mr. Hudson and Kanye West’s Supernova benefits from punchy precision and pacey rhythmic ability, while voices and instruments are distinctly rendered and placed. There’s a wide frequency range, too, resulting in tingly treble and deep, weighty bass. You lose a little of the very fine detail and dynamic subtlety when you play an Apple Lossless rip through the digital USB connection on the front, but the performance is still excellent. Perhaps more impressive, though, is that a switch from this to AirPlay incurs little in the way of further sonic penalties. At the other end of the spectrum, the Marantz will handle 24-bit/96kHz digital files, and while a product of this type is never going to fully benefit from the extra quality a studio master brings to the party, there is an audible improvement in terms of definition and dynamics. You can maximise the Marantz’s potential by adding decent speakers: Dali’s Zensor 1s are a good place to start. 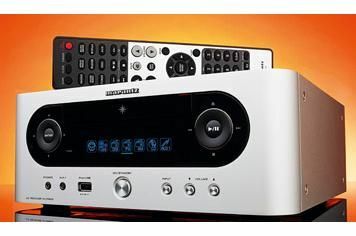 While the Marantz is no longer alone in offering a huge feature list, its superb sonic ability plus excellent usability ensure it still remains in contention for top position.